Through experimentation involving nuclear fusion came the realization that differentiated somatic cells have potential to show a plasticity that is not unidirectional.1–3 Subsequent studies suggested the transfer of a single somatic cell nucleus into an enucleated unfertilized egg possessed the ability to not only form all three germ layers but also produce viable offspring.4–6 Decades later, the direct reprogramming of fibroblasts into a pluripotent state, so-called induced pluripotent stem cells (iPSCs),7,8 has renewed interest in what constitutes the reprogramming process. An explosion of subsequent studies confirms that a large variety of somatic cells can be efficiently reprogrammed into iPSCs9–13 and subsequently redifferentiated into other cell types that recapitulate disease phenotypes.14–16 Such information offers proof-of-principle for the use of iPSCs as useful in vitro modeling systems that could ultimately lead to novel drug development and testing. Additionally, as iPSCs are produced from individual patients, the derivation of patient-specific stem cell lines could provide a limitless source of clinically useful immune and genetically matched cells. Here we review our current knowledge regarding the use of pluripotent stem cells targeted at kidney disorders. Specifically, it will address certain shortcomings of traditional model systems, current knowledge regarding the differentiation of pluripotent stem cells into the kidney mesodermal lineage, and the advantages of reprogramming for in vitro disease modeling and therapeutic interventions. Finally, the efficiency and safety of iPSC technology that governs the prospective applications and clinical promise for kidney regeneration will also be discussed. Understanding the process of endogenous kidney regeneration is important for the development of new therapeutic strategies aimed at cellular replacement and reversal and/or attenuation of fibrosis. As such, the reprogramming of adult cells to generate iPSCs7,8,48 with high proliferative ability and broad differentiation capacity represents a major advance for both preclinical and clinical applications. Embryonic stem cells (ESCs) are pluripotent and thus could offer important alternative avenues for regenerative therapies through differentiation into distinct kidney cell types. Pioneering studies in Xenopus laevis show presumptive ectoderm (animal cap) can be induced to produce all three components—tubules, glomus, and ducts—of the pronephros when cultured with known mesoderm-inducing factors, such as activin A and retinoic acid.49–51 In light of such success, subsequent studies using the same mesoderm-inducing factors have been applied to the mammalian metanephric kidney.52–55 It was apparent not only that the same mesoderm-inducing factors could direct the differentiation of embryonic bodies into various renal progenitors in vitro52–55 but also that such cells when injected ex vivo into developing mouse kidneys could integrate into tubules with at least 50% efficiency (reviewed in Table 1).53,56 Nonetheless, whether the ESC-derived progeny contributes to function of the nephron is not yet evident. Extending previous in vitro work,60 a recent report by Xinaris and colleagues provides novel advancement toward the therapeutic application of embryonic tissue in the potential treatment of renal diseases.61 In this report, renal aggregates (organoids) constructed from single cell suspensions of fully dissociated embryonic day (E) 11.5 mouse kidneys grown in culture were subsequently transplanted into immune-deficient rats. Remarkably, the implanted organoids were capable of generating vascularized nephrons consisting of functional glomerular and tubular tissue (Table 1).61 Although the transplanted tissue survived for only 3–4 weeks, the ability to grow and mature developing fetal kidney tissue in situ offers advantages, including the ability to better understand the gene regulatory networks required for both early and late kidney lineage specification and ascertainment of the local microenvironment necessary for renal stem cell differentiation and nephrogenic maintenance. With the organoids already committed down a lineage of kidney development, such an application relieves the need for an in-depth knowledge of the gene regulatory networks necessary for direct reprogramming, a feature that is a prerequisite for any directed differentiation of pluripotent cells into kidney lineages. Despite these advances, ethical constraints surrounding hESCs have limited their widespread use in disease modeling and other applications, forcing the investigation into alternative solutions. Disease-in-a-dish: recent advances in somatic cell reprogramming of kidney cells. iPSCs can be derived from both mesangial cells and urinary epithelial cells using either the traditional four factor (Oct4, Sox2, Klf4, and c-Myc) or two factor (Oct4 and Sox2) methods. The reprogramming of kidney cells to iPSCs that have a high proliferative ability and broad differentiation potential holds promise for both preclinical and clinical applications. For example, the directed differentiation of iPSCs to podocytes using conditioned media and morphologic selection has been successfully reported. Functional consequences for this memory also persist, whereby an inability to silence the original expression pattern equates to a tendency for iPSCs to preferentially differentiate back to the parental cell type.69 Thus, the potential exists for the residual epigenetic memory to be exploited in cases where limited knowledge regarding the gene regulatory networks involved in the production of renal progenitor cells is present—like that for the nephron. However, the difficulty in collecting viable kidney tissue hinders the ability to exploit such features. Innovative approaches, such as the isolation of various kidney cells from urine for cell reprogramming,22 have overcome such obstacles, making the ability to derive numerous patient specific iPSCs more feasible. Given the numerous proof-of-principle studies showing the ability of iPSCs to recapitulate the molecular basis and pathogenesis of multiple diseases,14–20,71–75 it is increasingly apparent that direct reprogramming might allow for the effective generation of pluripotent cells that carry the disease-associated genotype. The production of iPSC-podocytes, and potentially epithelial cells, allows an alternative culture method that facilitates both quantitative and qualitative interrogation of kidney cell function in disease. Despite these advances, numerous challenges hinder the development of in vitro iPSC-kidney disease models. These include the immense complexity owing to the involvement of myriad interwoven kidney cell types, the pathologic heterogeneity among various forms of kidney diseases, and a lack of knowledge regarding the developmental gene networks involved in directing the efficient production of specific kidney cells. Despite such complexity, it is essential to focus efforts on whether iPSC-kidney cell lines recapitulate disease processes across a range of renal disorders (Figure 2A). Multiple potentials exist for iPSC-derived kidney cells for studying disease development in vitro in order to develop and screen new therapeutics and deliver modified treatment regimes. iPSC-derived kidney cells from controls and patients with kidney disease could be used to measure the qualitative and quantitative aspects of the disease, effectively recapitulating the phenotype in vitro (A). 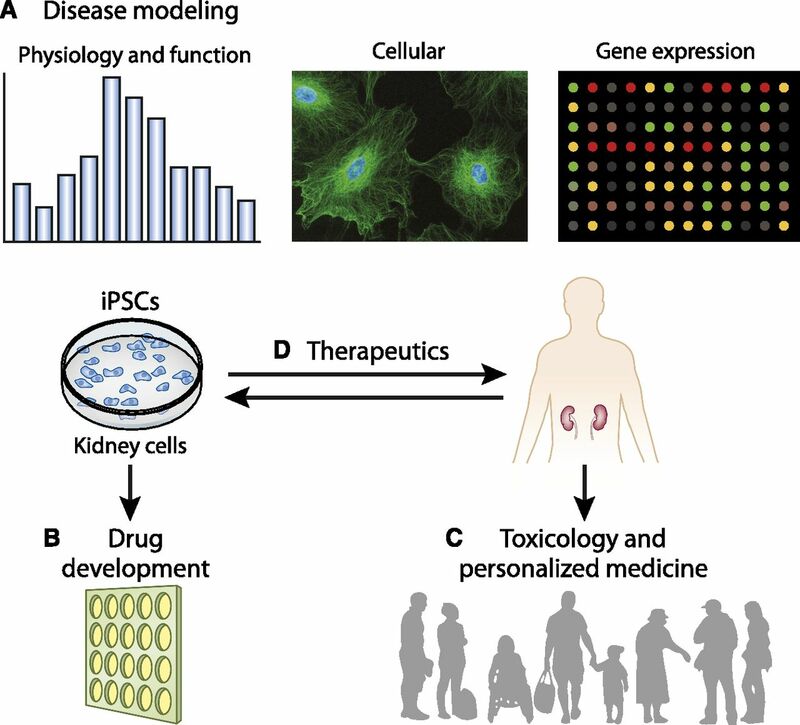 Further, iPSC-kidney cells have the potential to become multipurpose research and clinical tools for high-throughput toxicology screening and drug development (B), might be used in population-based screening for toxicologic aspects and personalized medicine (C), and hold potential for disease iPSC-podocyte lines to be corrected and used in cell replacement therapy (D). Finally, for the purposes of disease modeling, an assay of gene expression should be used at various time points after differentiation. A study conducted by Nguyen and colleagues74 reported that iPSC-derived neurons obtained from a patient with Parkinson disease showed varying gene expression profiles dependent on the stage of differentiation. Thus, iPSC-derived patterns of gene expression may be similar to that of the developing human counterpart. The ability for cells derived from iPSCs to recapitulate the disease phenotype could be influenced by such processes. The incidence of AKI and CKD is rising and reaching epidemic proportions. In patients with CKD, the progressive decline in renal function is multifactorial and attributable to a variety of mechanisms, including failure to resolve the inciting proinflammatory injury leading to the onset of self-perpetuating damage and ultimately the development of fibrosis and tissue attenuation. With such complexity, the need for disease models that recapitulate human kidney disorders is paramount. Mouse models that are genetically manipulated, bred, and maintained have been vital to advancing medical research and the study of disease pathogenesis. However, given the species-specific differences in physiology, genomics, and metabolic demands that exist between mice and humans,78–81 application of discoveries in rodents cannot be easily translated, especially with respect to therapeutics, where direct translation is vital. There are many advantages of developing pluripotent cells as a therapeutic strategy for patients with a variety of kidney disorders. Compared with other human kidney cell lines, iPSCs derived from mesangial cells have long-term proliferative ability and potentially a broad range of differentiation capacities, including podocytes.21,23 Furthermore, noninvasive procedures can be used, such as the collection of urine to obtain the necessary cells for reprogramming.22,88 However, it remains uncertain whether iPSC-derived kidney cells can be differentiated from target cells of other germ lineages, for example, skin fibroblasts that originate in the ectoderm. Nonetheless, iPSC technology provides a valuable tool to interrogate human disease and offers an unprecedented opportunity to develop self-renewing models that will facilitate mechanistic studies of disease. The screening of genetic mutations in disease-derived iPSCs and the development of functional assays in cells can also serve as a fundamental step for future studies to correct the genetic defects in selected tubular epithelium or in podocytes that maintain a proliferative capacity. For example, several genes encoding for podocyte nuclear and cytoplasmic proteins, slit diaphragm, and cell membranes have been identified as driving podocyte phenotype and functional abnormalities in subsets of patients with FSGS and nephrotic syndrome. The generation of iPSC-derived kidney cell lines from these patients that maintain their genotype and phenotype will be a valuable tool for better understanding how mutations cause disease, for screening new drug compounds, for developing disease-modifying assays, and potentially for developing autologous cell replacement therapies. These cell lines may provide information to optimize an affected individual’s personalized medical care and open up new sources for stem cell banking. Moreover, in the long term, the autologous transplantation of patient-derived iPSC-kidney cells, with correction of the underlying genetic defect, may provide an innovative approach for kidney cellular replacement. Although promising in the field of disease modeling and therapeutic discovery, current iPSC technology may not be of any direct therapeutic benefit due to the oncogenic potential of some of the reprogramming factors (c-Myc and Klf4). Ideally, the use of small molecules that induce reprogramming is favored.91–93 However, it should be noted that chemicals used could also induce toxicity, including carcinogenicity. Given that the injection of undifferentiated iPSCs in vivo inadvertently results in teratoma formation, additional refinements need to occur for their effective use therapeutically. Investigations into the production of somatic stem cells with a more limited potential for differentiation could circumvent this. The generation of induced neural stem cells by lineage reprogramming94 (explained below) is a useful example because such somatic stem cells have the ability to differentiate into their daughter cell types.95 Importantly, induced neural stem cells, when injected into immunosuppressed mice, failed to induce teratoma formation but instead were able to self-renew and also differentiate into numerous neuronal cell types;94 such a feature is important in their application therapeutically. Additionally, such cells also provide an unlimited source of neurons and other neural cell types for studying. In addition to iPSC reprogramming, other avenues for kidney cell reprogramming are being investigated,98 such as those involving lineage reprogramming.100 Although providing benefits over direct reprogramming of iPSCs, one disadvantage of lineage reprogramming is the requirement for information about target gene regulatory networks in order to transform one cell type into another. The use of six genes in the direct reprogramming of adult proximal tubule cells to nephron progenitors, reminiscent of the embryonic kidney, has recently been reported.100 This extends the future regenerative potential of stem cells in renal medicine. Direct reprogramming is arguably best suited to the kidney because it relies on information of the optimal culture conditions,98 which, in the case for certain cell types (such as podocytes), is already available.23 Another potential advantage of direct reprogramming is differentiation into desired cell types that can potentially be facilitated by the exploitation of the residual epigenetic memory favoring spontaneous differentiation to the parental cell type (discussed above).69 Future endeavors should aim to determine whether kidney-derived iPSCs show a tendency to redifferentiate back into the parental cell type. Understanding what genes are necessary for this spontaneous redifferentiation may provide further information on the regulatory networks sufficient for nephron and progenitor cell production. Although limited, methods aimed at efficiently inducing mouse ESCs into renal progenitors and fully differentiated cell types have already been developed (Table 1).53–55,57–59 Hijacking the knowledge of such technology to generate mesodermal and renal lineage cells from iPSCs could be possible. Finally, it is yet to be explored whether dedifferentiation and redifferentiation processes induce changes in the resulting somatic cell that are different from the parental cell type, such as changes involved in proliferation and senescence that give iPSC a more immature phenotype. Differentiation of iPSCs into cardiomyocytes provides evidence of this,101 where these differences could potentially confound any results obtained in the disease modeling and drug discovery potentials. Although knowledge that differentiated cells can be reprogrammed into a pluripotent state, or indeed another lineage, has been known for decades, the recent interest in this phenomenon can be attributed to the latest developments in somatic cell reprogramming over the past several years. Effective disease models and drug screens are the current focus, but more ambitious applications with respect to regenerative medicine will follow. In contrast to many other fields, the kidney is yet to substantially gain from such technology. The accumulation of recent reports describing the manipulation of iPSCs for applications in kidney disease modeling act to address certain shortcomings that hinder their widespread use, such as the derivation of iPSCs from epithelial cells isolated from the urine. With so much left to learn, future challenges will involve mapping the redifferentiation of iPSCs into the many cell types of the kidney and investigate potentials into gaining new insights into disease processes and therapeutic interventions.